I tried out the PAIA 2720-3B VC Bandpass Filter on the breadboard. I wasn't initially that impressed with its range. However I swapped the diode for a red led and drove it from an exponential current source, the result was a great increase in the range of the filter. I also changed the way in which the Q control was implemented, resulting in, in my opinion a more natural control contour. I also made a second version with a simpler current source using just one NPN transistor. The results were still very impressive. The most interesting characteristic of these filters is the way they behave when overdriven. With high Q settings, the LED becomes modulated by the very signal that it is controlling and things freak out somewhat, the LED flickers too in response to the large signal swing! The original is included for comparison. 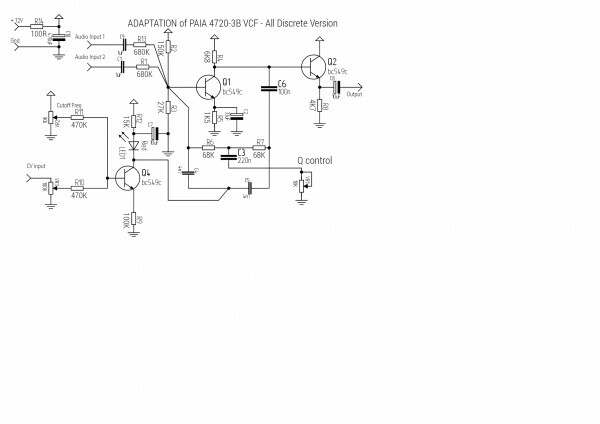 I tried out the PAiA 2720-3L Lowpass filter. Again it worked better with LEDs instead of diodes and a current source to drive the LEDs. I chained two Lowpass filter sections together to make a 4 pole filter. It was quite good but would really benefit from having a Q / resonance control. I'm going to have to figure out if this can be done. 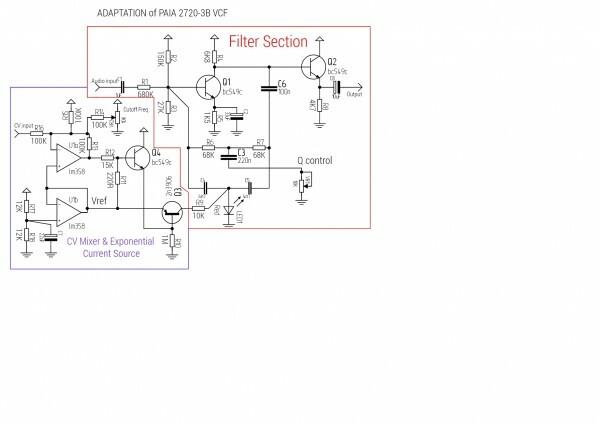 This version of the 2720-3B bandpass filter has a linear current source that doesn't have any tempco problems. I was just trying out the circuit from my last post again and it would seem that 68K is a better choice for R12 as it allows the filter to be completely closed. I suspect that there might need to be a bit of experimentation with some of the resistor values to accommodate different LED's. Specifically, R9 & R12. I built 2 of the PAiA 2720-3B bandpass VCFs and designed a little two transistor mixer and output stage with 10 V peak to peak maximum output. The sinewave generators represent the 2 filters, the 10K resistor on the right represents the output load. I did find that putting a 100n ( 0.1uF ) capacitor between the collector or Q2 and ground helped a bit. Does anyone else have any suggestions about making this behave. 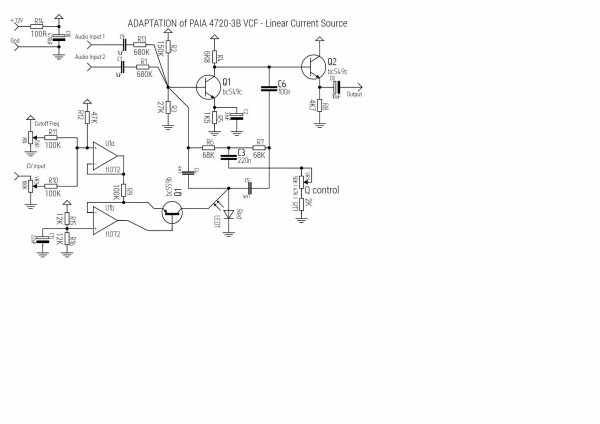 I was thinking of using either an FET optocoupler or a vactrol instead of the diode to tune the filter in order to avoid the circuit using the same ground as the control signal. I always think about trying the most simple PAiA circuits. Well for the twin T filter (2720-3b) I'd try with a photocell instead of the diode and a circuit to control the LED. Or a real vactrol instead of a DIY one. But DIY you can use a more adequate range for the photocell and have less work fine-tuning it's right resistance range. 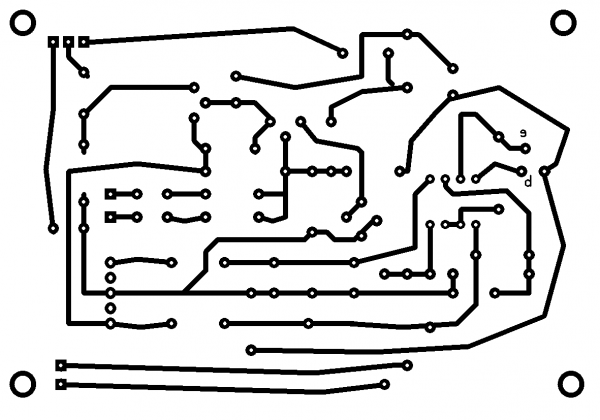 There are many schematics for vactrol CV around from other circuits (Buchla LPG, etc.) but I'd try something much simpler first, the simplest possible. Thanks for the complement Fernando! 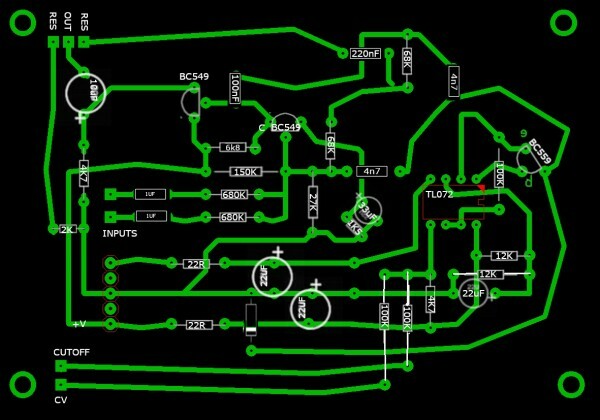 I have several vactrols and have been meaning to try them out in this circuit. Using a diode or LED have their own charms due to the distortion generated when the filter is driven with a strong signal. I do like vactrol based filters though, they have a dynamic character of their own. Using a diode or LED have their own charms due to the distortion generated when the filter is driven with a strong signal..
Yeah, Ge diodes sound like a good idea, never tried them at the time. My experience of clipping diodes in pedals is that Ge diodes have a "softer" sound than Si diodes. You need a couple in series to match the Fv of silicon, though. Today I tried Ge diodes with a similar filter circuit and it did sound more agreeable ( less harsh than the Si diode ), I also tried an led but I think it sounded worse than the silicon diode ! but in the same position as in the PAiA band pass? I mean, as the variable resistance to ground at the bottom of the twin T? Yes the diode was in the same position as with the PAiA circuit. LEDs have a fairly high Fv compared to silicon or Ge, they're pretty harsh in pedals, too translates to high levels before clipping. Gasboss, what power are you using for V++ and V--? +/- 15V? Gasboss,j what power are you using for V++ and V--? +/- 15V? The circuit works from a single +Ve supply rail +12 to + 15 V, 15 would provide more dynamic range for the signal. Posted: Wed Jan 09, 2019 12:53 pm Post subject: notch? i'm really interested in this filter. i'm going to build it. but what about modifying it for "notch", aka, band stop output? how would you go about that?